… and we decided to improve the shining hour and made an appointment with the current owner of SY OLIVIA, a yacht we had already inspected last week. 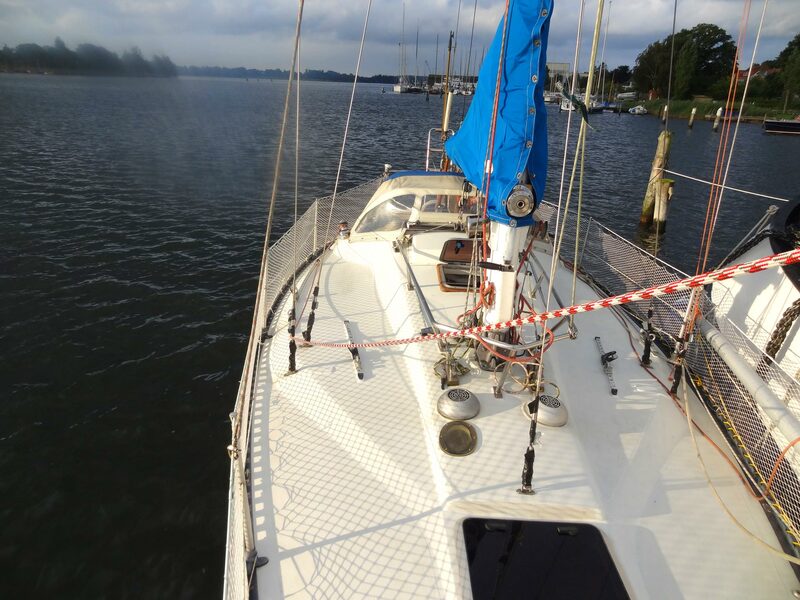 To be honest – we took into consideration to buy her as our first ever sailing-boat and wanted to see how she behaves in the water. So we arrived a day earlier, her current owner invited us to spend the night onboard: “You get a better feeling for the boat. Even moored in port it´s a special experience. Use her toilet, prepare a meal and roam about inside the saloon.” A nice suggestion and so I loaded our gear (way too much) on board. OLIVIA has been brought to water two days earlier by her owner and he had already made an oil change, refueled and prepared the boat for the trip: All the sails, fenders and stuff were already on board. Everything fine to cast off. Dawn, perfect day as I take a glimpse outside from my berth. Exciting: Our first night onboard a sailing vessel. After dinner – in proper style salmon and shrimps on fresh baked bread – we thought of who would sleep in which berth. The King´s Cruiser 33 has 6 berths: Two in the forecastle, 2 double-berths and one single in the saloon and one spacy quarter berth in the aft section of the boat. My wife chose to sleep in the saloon and so I took my son into the forecastle. The berths there have been extended by her current owner of about 20 cm and being taller than 1.86 m I still had enough space for my legs, though my toes did occasionally reach the bow. But room enough for me and my son. Lights out. Sleep well honey. Well, not so much, to be honest. 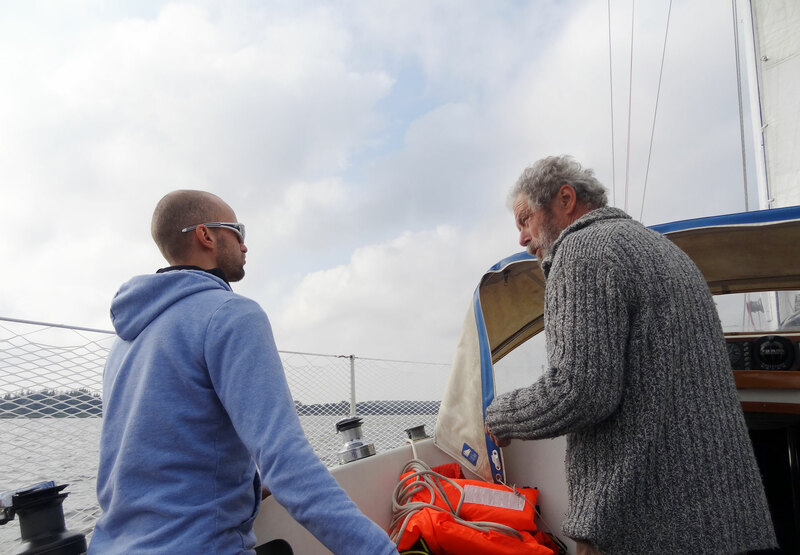 Even though we´ve had a fender up in the mast for compensation of the masts vibrations in the wind that regularly shaked the whole boat, I must admit that the adjustment to all the new sounds took some hours. 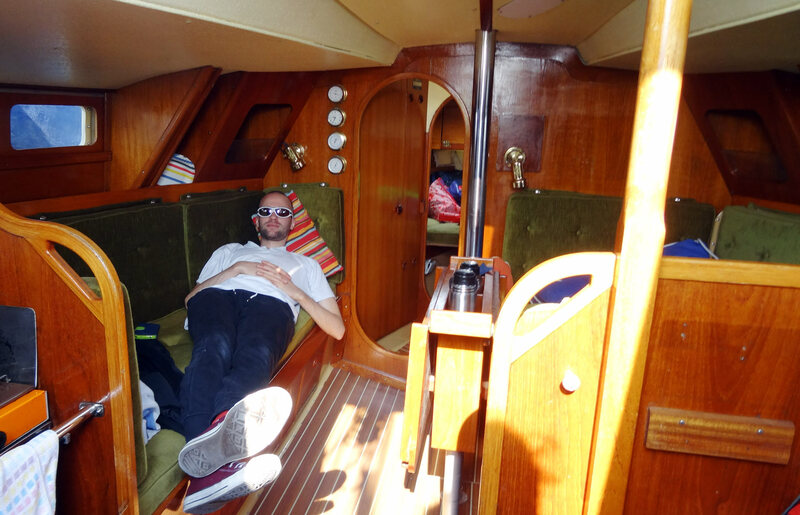 My son had non such problems: He instantly fell asleep in the constant smooth rolling of the boat. My wife had different problems: Though the cushion of OLIVIA is of good quality her current owners chose to sleep very hard. Too hard for us as it proved. Next morning: The boat is ready for her test run. I am so excited. But eventually we all fell asleep and I must say I had a very good night. 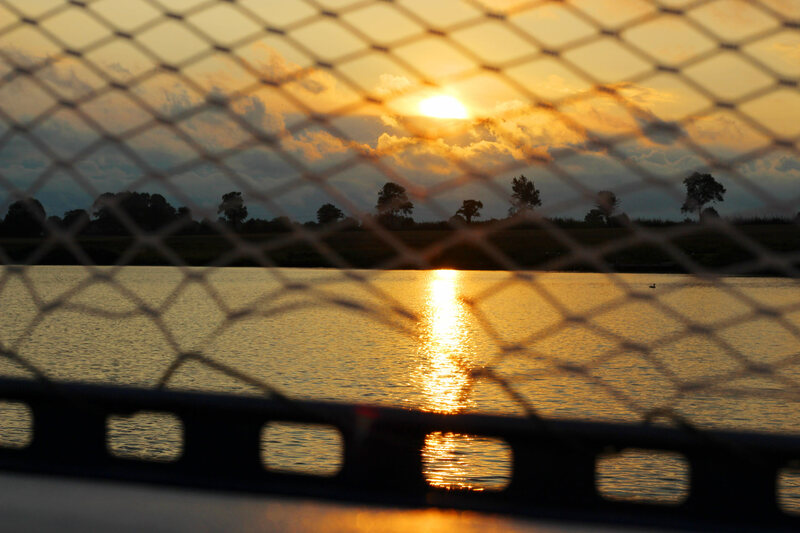 I really enjoyed the constant burble of the water along the hull right beside my ears and even the knocking of the ropes all along the mast, the wheeze high above and all the sounds of nature had a relaxing effect and provided for a good night sleep. It was right after dawn, shortly past 6 o´clock in the morning, when my son laughed in my face: Time to get up, daddy! I opened the hatch right above my head and fresh, clean warm air instantly surged down into the cabin. Wow, the smell of late summer with a bit of salt. You can´t pay for that. Berthing alongside her current owners, OLIVIA and I are ready for the testrun. One hour later the owner came onboard: “Ready to go?” Of course! “Clear the ship and I´ll be back in 30 minutes.”, he said. It took me 20 minutes to clear the ship, stow away the night´s clothes, sleeping bags and hygiene-utensils, prepare the galley for swell. “What will it be like?”, I was asking myself and tried to remember all the things I had been reading lately about a yacht´s test run: Check all the rigging, look for the sails and proper ropes. Check all hatches and portholes for incoming water, run the engine from cold-start for quite some time. Does the rudder have tolerance and do all the electronic equipment work properly? Dammit! I forgot my squeamishly prepared checklist at home which I have been compiling after reading two books on how best to buy a used sailing vessel. Anyway, I think I was too exhilarated anyhow to planfully go through a list: Hey, ho, this was my first sailing trip! This morning promised to turn into a fine windy and sunny day. After casting off all lines the helm was placed in my hands. Mr. Adler stayed only for casting off at the helm. Engine came on running instantly and the three cyclinders were running smoothly in neutral gear. “Cast off all lines except stern line! 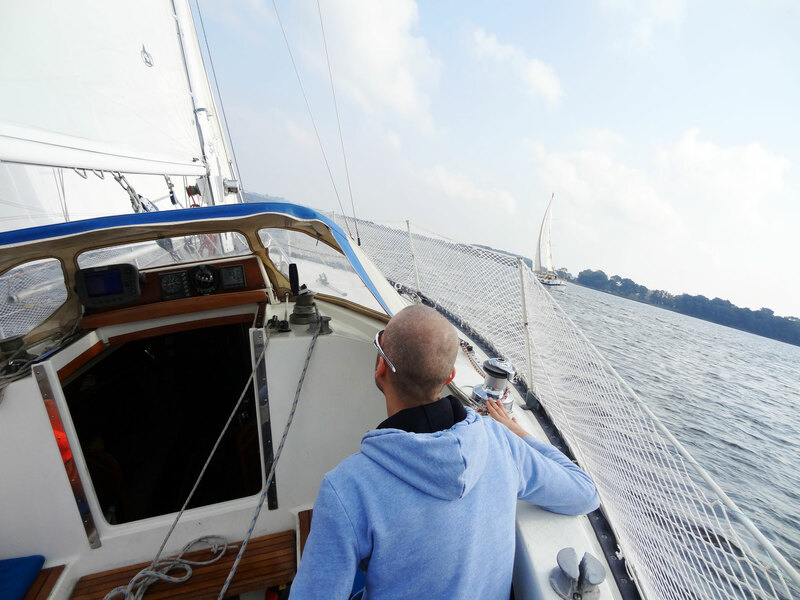 Recover and stow away all fenders!”, his orders came in quickly, I suddenly found myself being a real part of the crew – bearing in mind I hadn´t sailed before, this was my first time ever! I took in all the fenders, coiled all lines and ropes and off we went. I went back into the cockpit where he was steering, but he instantly sent me to the mast: “Set mainsail!” I worked hard on the winch, one minute later the sail was killing in the wind, Mr. Adler close-hauled the mainsail, we then set the genoa sail. 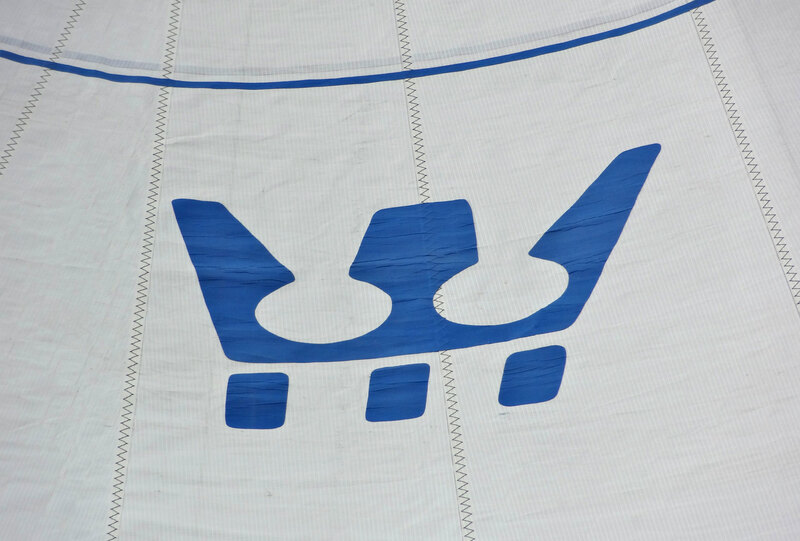 Proud white sails: The SY OLIVIA flies the insignia of her makers, Fiskars of Finland. In an instant the boat was speeding up – considering a very weak wind of up to 4.5 knots I was astonished of how fast the boat responded. Turning off the engine we just heard the water splashing around our bow. “Take over helm”, he said and placed me in the back of the cockpit. 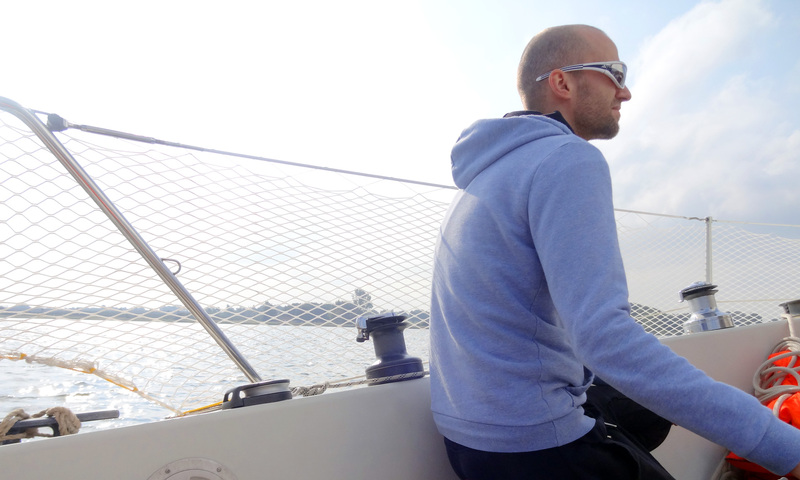 Did I mention that I never ever steered a sailing boat before? “You want to buy that boat? Well, than be in charge and thus become acquainted. That´s the best way”, Mr. Adler insisted. It was not a no-brainer but I cannot say it was hard either. We were sailing downwind and OLIVIA made between 3 and 5 knots. Being under land the wind came in with light gusts but nothing that would scare a skipper. 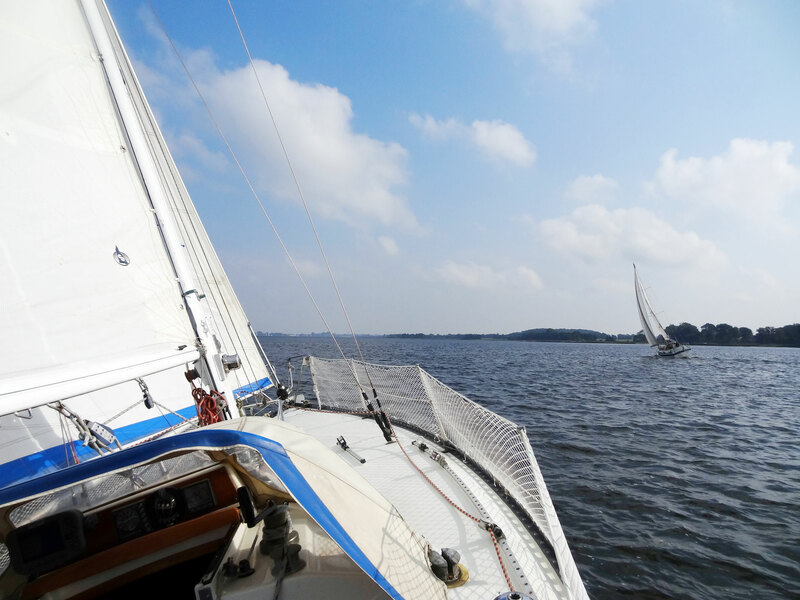 The Schlei is a beautiful but tricky water: Very shallow parts not deeper than 50 centimeters and big rocks constrain the watertraffic to follow a buoyed waterway. “Keep the green buoys to the starboard side, the red ones to your left”, he advised me. I had to helm the OLIVIA right from the start of our trip. What an adventure! Steering between the tons was stressful as we had upcoming traffic and our boat being faster than others would overtake from time to time: A the tightest point the space between red and green would be no more than 20 metres. I really felt the flow of water streaming around the rudder – the tiller transmitted every change in direction instantly. I really appreciated the direct response. As we cleared land and came a bit more free the wind-pressure increased and I got my first gusts. The fun began when we tacked and made our way back. We had to close-haul our sails furthermore to steer hard upwind: Mr. Adler didn´t take in sail (maybe with respect to me being a greenhorn) and so OLIVIA spurred forward with up to 7.5 knots. Wind came in gruffy and I had much more correction work to do in order to hold the ship right angle in the wind. I rode out some more gusts and Mr. Adler looked at me for quite some time, then said: „And you really never ever sailed before in your whole life?” Well, to be honest: No. When my father turned 40 more than 20 years ago we were having a small sailing trip on a yawl on the Balaton, but back then I was a small boy. Test-run your used sailing yacht and take her out on the water before you buy her. He nodded: “Not bad, really not bad …” I replied that everything I do at the helm I do because it just feels logical. When a gust of wind pushes the boat I give rudder. After a while I take her back hard on the wind. „It´s something like flying“, I said: „Somehow it feels like we are riding like a surfer right next to the edge of a wave. And I try to stay up here right on the wave.“ Doing everything I could to not lose this “right” feeling on the tiller. I had to fight againts gusts, blows of wind and sometimes seconds of calm. Then again I had to outbalance the weather helm of the vessel. No minute without something to do. So exciting. Asking a thousand questions and drawing as much knowledge as I can from her you current owner. Sailing upwind is much more aggressive and stressful but at the same time it´s definitely more fun and tantalizing. And, of course, faster. I sometimes, when a gust was hitting us hard, got a glimpse down the saloon and could see our portholes be under water. A constant gurgle and whirling of blue-greenish water wildly foamed right behind the windows. Sometimes we had a heeling of more than 45 degrees. I know we cannot capsize. But … well, it needs getting used to at the start. Later, the more gusts I managed to ride out, it turned out to be great fun. 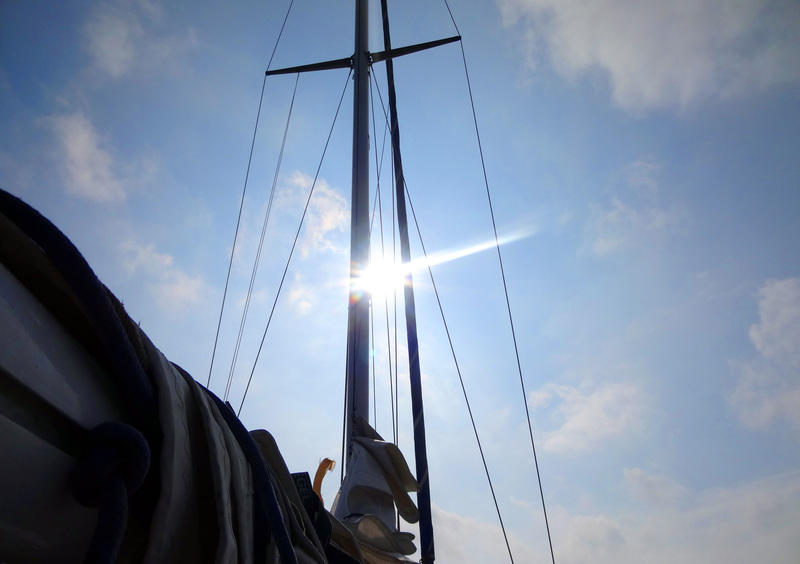 … steering a 33 feet-sailing vessel is quite a chunk of work. It´s exhausting. 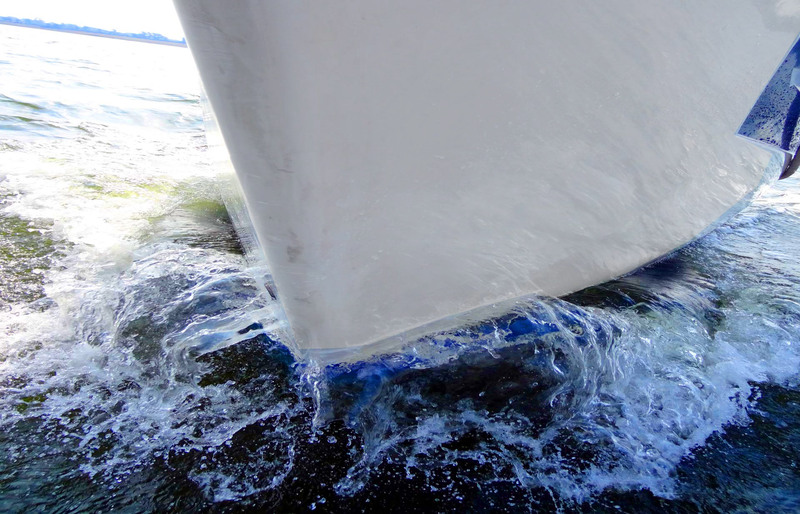 Full concentration all the time – anytime a hard gust can pull on the rudder and push the boat on her flanks. I sometimes need so much power and have to virtually pull as hard as I can to keep her on course when waves and wind-gusts hit her sails hard. What really astonishes me is the fact that Mr. Adler has only twice in the whole of 3 hours to correct the bearing of our sails. I feel my heart beating hard. I am in charge of this vessel in the midst of the narrow channel, more and more sailing vessels and I carry the responsability for my wife, my son and the boat itself. Taking OLIVIA close to wind: I´ve managed to overtake a Hallberg-Rassy leewards. From a psychological standpoint what bothers me most is that we do not have a brake here. I now, when there is no other way than to stop I could anytime shoot in the wind and bring her to a halt almost at an instant, but anyway it feels strange. Overwhelmingly strange. But also very satisfying and fun. Just as my teacher back in driving school, Mr. Adler told me „I don´t see any problem. You will manage this 33 feet-boat with ease, believe me.” Well, as her seller it could have been a compliment just to motivate the purchase, but I think he ment it honestly. At least, I hope. Controlling her even in wind gusts – the fun part of being at the helm. We spent the rest of this sunny day on deck. Still a bit shaky and overwhelmed by the stresses and all the impressions from this exciting test run I began to ask my questions. We sat down on his boat and he calmly answered all of them. His wife took out the contract of purchase and we ran through the paragraphs. And finally. We signed it. My wife and I had made our decision back yesterday when we arrived. It was clear that if the boat behaves well and all is fine during the trial that OLIVIA would be our boat. 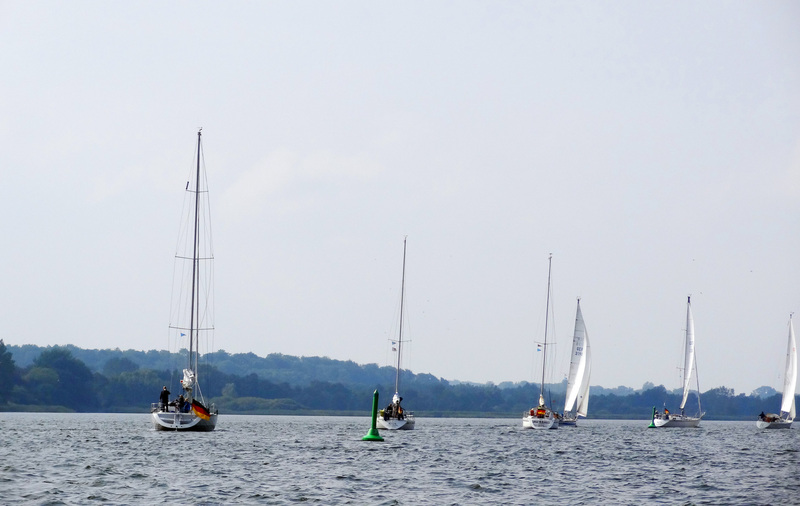 Very tight shipping passage – a yacht procession on a fine day on the Schlei. So it took just a deep look right into our eyes and it was agreed. Champaign (well, Aperol-Spritz non-alcohol) was pouring into the crystal glasses and we drank tot he ship and her new owners. A feeling so indescribable, so intense – so beyond words. So much joy just as if it was christmas and birthday alltogether. We are boat owners right now. Unbelievable. But now the real tasks are ahead. So much to do: I have to get an insurance for the boat quickly. Her winter-storage has been organized by me during the last days and now I am planning the transfer-trip of the boat from the Schlei back home to where we live: Hamburg. That means a tour of some 150 miles, down the Baltic Sea to Kiel, to the North Sea via Kiel Canal and upriver Elbe. 4 to 5 days of adventure and fun coming up. Three hours of suspense and positive stress – relaxing in SY OLIVIA´s saloon. As we prepare to drive home we recollect our impressions of the past two days: What a nice boat this King´s Cruiser 33 is. Spacious, smooth lines, well equipped and full of grace on the water. Everyone of my family is comfy with OLIVIA. She is a beautiful fast sailing reliable boat. Everything works just fine on board, her engine without problems (and running surprisingly gentle), gas, hheating and cooler are working perfectly: As I pack the sails back into their tarpaulin and reinstall the boat cover for the cockpit I remain still for some minutes to memorize the view of the boat. And we cannot wait a second to return onboard. 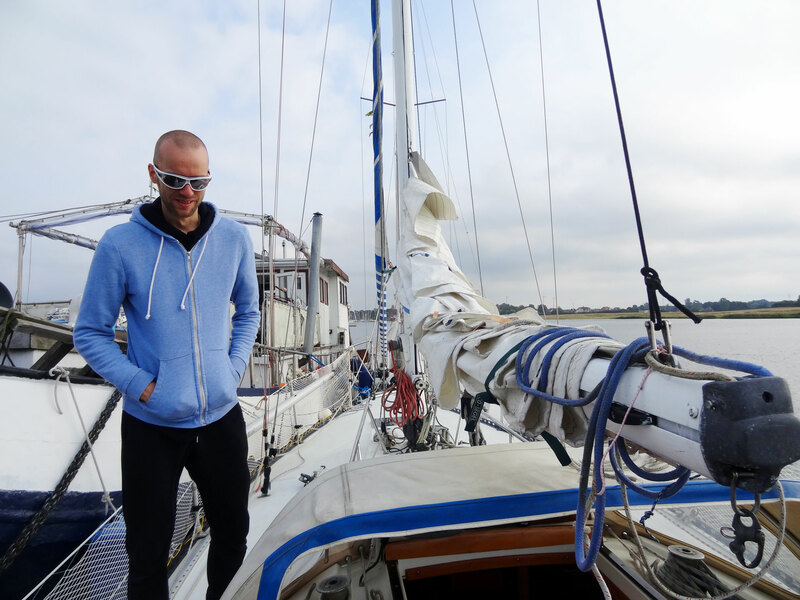 What was your first sailing trip like? I look forward to your stories and comments. Congratulations! Kalo Risiko (as the Greek say) will she keep her Name? Traditionally in German: Mast und schotbruch, und immer eine Handbreit Wasser unter dem Kiel!!! hi chris & thanks. as for now she´ll keep her name. i´ve heard that if you change it the ship´s kobold will leave her. and we don´t want that. OLIVIA is a really nice name. greets. viel Glück mit der Lady, immer eine Brise Wind auf dem richtigenKurs und : meide die Untiefen. Nice site! I bougt my KC33 2 years ago and look forward to follow your project. New Electric is one of many things on my wishinglist. Previous Post	SY OLIVIA – A fine King´s Cruiser 33 by Fiskars. Next Post	Legal stuff for a yacht purchase.